The HP Ipaq (formerly known as Compaq Ipaq) is a fantastic portable device. With a colour touch screen, and packaged with Windows Media Player as part of the Pocket PC OS, it's the "ultimate" gadget fanatic's toy. Unlike a normal MP3 player, it has an advanced Graphical User Interface that makes selecting your song easy from a list which displays the song title. This is important when your Expansion pack's Flash Memory card is a full 1GB, coupled with a 256MB or 512MB SD card on the integrated SD slot. You're basically looking at having hundreds of your favourite songs on one device, and don't forget it's the road we must be concentrating on here! It also has a whole lot of PDA functions, and can also be expanded to be a GPS! And this is great. We have one small device that holds hundreds of our favourite songs, but how do we listen to them while driving? For a start, there is the Cassete Adapter. 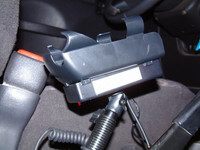 This sometimes works, but quite often the head unit will reject the tape, or lock up and refuse to eject OR play it. We've experienced both, and it's not fun. Not to mention the cable that is left hanging accross your dash board getting in the way. It's frustrating to say the least. Secondly there is the option of replacing your stereo with an aftermarket one. Many aftermarket head units are available with one or more auxiliary inputs, similar to home stereos. A simple cable from your MP3 Player's headphone socket to the Headunit's auxiliary input, and you're good to go. This option will produce the best quality, being designed originally to perform this task. This would be the best route, but possibly the most expensive and requires the most work. And then there's the Arkon MultiMedia Mount which transmit's your sound directly to your factory head unit's FM antenna! The Arkon Multimedia Mount serves two purposes, and due to the modular way it is built, you can leave one at home if you want. 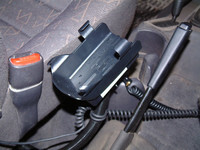 Firstly, it provides a mounting point for the Ipaq in your vehicle, and they have a vast range of mounting options to suit your vehicle. The mount is great and low profile - the Ipaq neatly slides into the mount, which has enough space behind for even some of the earlier large GPS Expansion Packs. We chose to mount ours behind the Gear Stick between the two seats, as we have no factory center console. After one quick drive, and the inevitable brake-tests when driving on the Omani Roads, we found there was a slight problem with that idea. The Ipaq has momentum when you are moving, and hitting the brakes caused it to shoot out the front of the mount! Fortunately the Charging and headphone cables stopped it from going far! This was easily fixed by adding a thin piece of grip-foam to one side of the mount. If your chosen mounting point isn't so flat - you probably won't need to worry about that! Another point worth mentioning is that if you choose to mount up higher on the dashboard, the Ipaq's backlight may become a distraction when driving at night. You have the ability to set the backlight to turn off after 10 seconds of "no activity" and don't forget to set this up for when it's on charge too! The other option which I prefer is assigning a "kill screen" button in Windows Media Player. This allows you to turn the screen and backlight off or on again with one of the hardware buttons on the Ipaq. You can assign other buttons to perform functions such as "next track" and "pause" for when you don't want to use the touch screen. The compatibility list below is from Arkon's website. The new HP 5400 and 5500 series is not officially compatible. The problem is the new sleeves that have a hard cover for the screen and simply don't fit. The solution is that HP / Compaq have been very smart to not change the exterior shape of the Ipaq, and as a result the sleeves from the 3600, 3800 and 3900 range will fit right on the 5400 or 5500! We originally used the 3630 Ipaq with the mount, as seen in the pictures, but that one had a few too many collisions with the ground. Credit to the manufacturers of Ipaqs, it withstood a lot more drops than I expected it to! The HP Ipaq 5450 was the replacement, with the nice addition of fingerprint reader technology, so you don't have to look at it to enter a PIN when you turn it on. We can confirm that the new sleeves do NOT fit in the mount, but that the new 5xxx machines wearing the old sleeves DOES fit. That covers the "Mount" part of the name, now lets look at the "Multimedia" part! 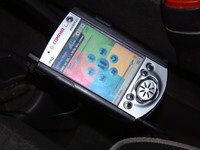 The Transmittor works by having a short cable that plugs into the headphone socket of your Ipaq, and another one that goes into your Cigarette lighter socket. We now have a multi-socket block sitting under the drivers seat, allowing the Transmittor and Ipaq charger to be used simultaneously. 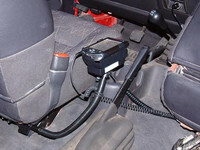 Arkon DO have battery operated FM Transmittors, but these are stand alone devices , not combined with the mounting unit. The sound that comes out of your Ipaq is then transmitted on an FM channel of your choice, set by a turn dial on the bottom of the device. The Transmittor is FCC compliant and no licenses are required because it is only able to transmit over a short distance. It is funny when you tell friends you're able to play your MP3 player in your car, on THEIR speakers! The second issue is the quality of the audio signal. This is an issue many personal FM Transmittors share, and is compounded by the weak factory stereo system of the Wrangler. Low bass isn't transmitted as clearly as some would like, but it is defnitely good enough for most people. In all fairness, the stock Wrangler Stereo system is one of the weaker links. The Device is very sensitive to Cell Phone interference. You may have noticed this interference in speakers when cell phones go off, which is usually quiet. When using this device, the interference is definitely noticeable. This is actually pretty good when you have the roof off and wouldn't hear it otherwise! All in all it's a pretty neat piece of kit for the money. One of our favourite Summary lines at Oman4x4.com is "Would I do it again?" and with this one - we actually have! The first one was broken while the Jeep was being serviced. It was replaced with an identical one, and the second one gets left at home when the Jeep gets serviced! Would I do it again? Already did.